$100 OFF Katie Brown Educational Professional Development Programs – Book Today! The educators and staff at the Katie Brown Educational Program work tirelessly throughout the year to ensure that our young people and adults have the education necessary to promote peacefulness and healthy relationships throughout the year. 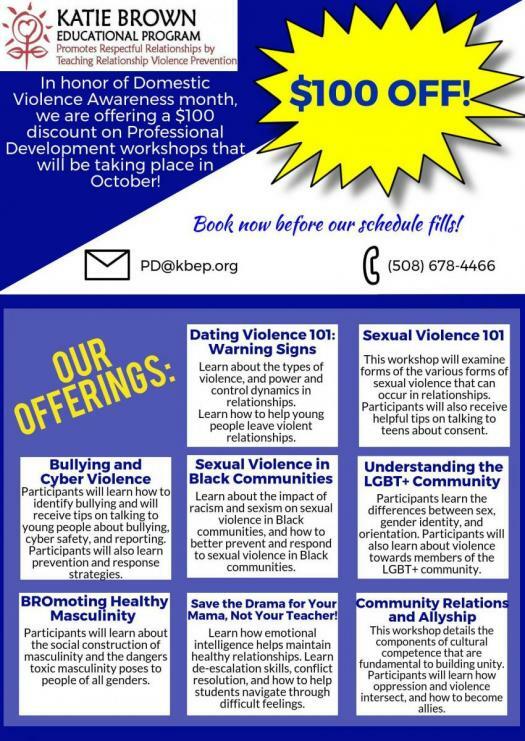 This year for Domestic Violence Awareness Month, if you book a professional development workshop with us that is scheduled to take place in the month of October, you will receive a $100 discount! The Katie Brown Educational Program educates young people and adults throughout Rhode Island and Southeastern Massachusetts about relationship violence prevention. In 16 years we are proud to say that we have reached over 80,000 participants. At the core of our curriculum we teach students, now in grades 4th grade through high school; and we are excited to announce that our program continues to grow and expand. Our Professional Development catalog now includes workshops for teachers, parents, health professionals, social workers, corporate staff, and more! Please view the flyer below to learn more about this “can’t miss” promotion! For more information, visit kbep.org/professional-development or call (508) 678-4466. ← KBEP Now Teaches 4th Grade!